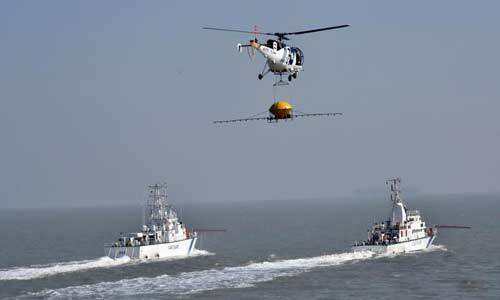 The Indian Coast Guard today conducted its first-ever exercise in Gujarat showcasing how it will undertake cleaning of coastal belts and ocean in the event of oil spills. The exercise, called "National Pollution Response Exercise,” was conducted at Gulf of Kutch near Mundra port in Kutch district involving 250 jawans in the presence of Chief Minister Vijay Rupani. “Our prime minister has launched “Clean India” campaign and similarly, the Coast Guard has launched the campaign to keep coastal belt and ocean clean,” Rupani told reporters after the exercise. Rupani praised India's coastal security agency for securing the country’s coastal belt and also talked about efforts made by the Centre under Sagar Mala project, which is a Centre’s initiative to modernise and develop India’s ports for nation’s development. “The Gulf of Kutch spreads around 7,300 square km covering ports like Kandla and Mundra, and nearly 74 per cent of crude oil of country's total import come through these ports,” a press release issued by the state information department said. “Indian Coast Guard has been appointed as the nodal agency to keep the coastal belt clean and conduct such exercises every year in various coastal areas in the country. “Gujarat has for the first time witnessed such type of exercise,” the release added. Security officers of countries like Australia, Sri Lanka and Mauritius were also present and observed the drill conducted by the Coast Guard jawans.